I sit this morning being bathed in luxurious rain. The kind of life-affirming, life-giving rain the Smokies are noted for. A quick run to town watching the rain cascading down the asphalt, clear here and muddy red there, being sucked in circles down storm gutters or overrunning clogged ones – and a couple of thoughts came to mind. It’s kinda sad to think about how the “built upon” landscape with all it’s concrete and asphalt is robbing our aquifers of precious water by collecting it and jettisoning it into creeks and streams and rivers and sending it on it’s way. Rain that used to settle in vernal pools to create breeding grounds and nurseries for frogs and salamanders and other aquatic creatures is directed through culverts or impeded by dams. Water that used to settle in wetlands is, instead, swallowed by storm drains and channeled towards the Gulf of Mexico. And to think of Januarys past and how moisture like this would have fallen, most likely, in the form of snow. And how snow packs sit stoically upon the mountains, reluctantly relinquishing their cold wetness slowly, letting it percolate through the soil into the aquifer. Most climate change models predict warmer and drier climates across the Southeast. With even less rain falling and more rainfall being diverted to storm drains, etc. as population growth and urbanization continues it’s easy to see how the Smokies and most of the Southern Appalachian forests will become tinderboxes. If the leaves that begin to fall and cover the forest floor by mid-October don’t get their normal autumn soaking and don’t get their winter covering of snow it will take only a lightning strike; a wayward match; an untended campfire; a brush pile burned in the wrong conditions; or some deranged pyromaniac and we will see the kind of catastrophic wild fires that plagued the drought-stricken West last year. And they will likely be more devastating in terms of human-impacts because of denser population levels in the East. Not all climate change models and/or climate change researchers predict a wholesale drying of all the peaks in the Southern Appalachians. Some believe that the phenomenon of orographic lift – where prevailing moisture laden winds from the Gulf of Mexico and the Atlantic Ocean run into the mountains and are quickly lifted up and cooled resulting in precipitation will create a refuge of cooler temperatures and wetter conditions at higher elevations in the Southern Appalachians. But there are still a couple of reasons for concern. 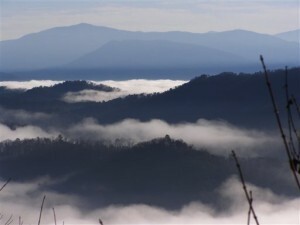 Recent research at Purchase Knob in the Smokies pointed out that perhaps as much as 50 to 60 percent of the region’s total annual precipitation is in the form of fog and/or mist, and that these tiny atmospheric droplets of water could dry from an increase in temperature. Plus, south and southeast facing slopes that are already dryer than their counterpoint north and northwest facing slopes may dry out more and once large hot fires become established, it’s amazing what they can burn through. I look out into the grey, rainy woods again and, at least for now, am thankful for this sweet dampness.